For a long while we thought that giant chocolate Easter eggs wrapped in bright metallic paper were a Brazilian thing, since that was where we saw them first. Turns out that large, hollow chocolate eggs filled with candy or other treats were an Italian thing all along, likely brought to Brazil by Italian immigrants. In Italy, it turns out the art of the chocolate egg has reached a completely new level, with gigantic, ornate varieties. You can get an astonishing variety of chocolate Easter eggs in Italy, as seen below, from cheap store brands to decadent (and expensive), specialty eggs. Your local Italian grocery store may have a few to choose from, though you won’t find the selection you would in Italy (or online). Another sweet treat you may find on Italian Easter tables is the Marzipan Lamb or Pecorelle di pasta reale! Fanciful, shaped marzipan is a mainstay for Italian holidays, such a frutta martorana for All Saints’ Day, so it is only appropriate that we find a special Easter-appropriate lamb for this holiday. If you have the almond paste (which you can usually buy ready-made) it is not terribly difficult to make a Marzipan lamb, and you can find them in many Italian bakeries around Easter, though this also has us hankering for the decidedly more American lamb cake! If you are looking for more Italian Easter treats, be sure to try the colomba cake or pastiera. In France, April 1st is known as “Poisson D’Avril” which translates to “April Fish.” Much like April Fool’s Day, pranks are rampant, and on Poisson D’Avril the goal is to tape a paper fish to the back of an unsuspecting person. It also means that there is a proliferation of all things fish. Chocolate fish are one particularly popular option, and can be found in stores throughout France. Making your own chocolate fish at home is super easy – AllRecipes has a detailed guide. Aside from the chocolate, all you need is a fish-shaped candy mold (there are tons of options). The Spruce has a recipe for molded chocolates filled with chocolate ganache for even more fun. One of the big events in town this Spring is the Ancient Egypt exhibition, Pharaoh: King of Ancient Egypt, at the Cleveland Museum of Art. M has always been a huge fan of ancient Egypt, and now the whole city has Egypt on the brain. A box of these gorgeous Ancient Egypt-themed chocolates from Maggie Louise Confections would be the perfect treat before the show – when they popped up on my Instagram feed I was instantly struck by their gorgeous colors! We didn’t find any Egyptian traditional recipes that called for chocolate, but if you are in Cairo, be sure to check out House of Cocoa for all things chocolate. However, there are plenty of other Egyptian desserts that would be great to try including Basbousa, an almond semolina flour cake and Umm/Om Ali, a bread pudding made with nuts. Who doesn’t love flourless chocolate cake? We certainly love it, and apparently the Swedish do as well. One of the more popular cakes in Sweden is Kladdkaka, which basically translates to “sticky/gooey chocolate cake.” The recipes for this cake seemed too easy NOT to try, and were uniformly beautiful, so on a whim we decided to whip up our first Kladdkaka last night. The cake we made really was a dream – that is, if you like chocolate (don’t talk to us if you don’t). We followed the Kladdkaka recipe on Call me Cupcake (as pictured above), which is flourless and gluten free, but other Kladdkaka recipes sometimes incorporate some flour, too. You probably already have all of the necessary ingredients in your fridge/pantry, so there is no excuse not to make this cake! Valentine’s Day is right around the corner – which means that all things chocolate are now “seasonal.” Whether or not you are into Valentine’s Day, you are probably a fan of chocolate – we certainly are. Really good chocolate is a pleasure year round, and we were fascinated by this video from Eater’s How to Make Everything series about how chocolate is made at a Mexican chocolate farm, starting from growing the cacao pod, through drying, fermenting and roasting the beans. Honestly, it is much more of an involved process than we expected, which makes us appreciate our precious chocolate bars even more! We are completely enthralled by the latest creation by French artist Alexandre Dubosc, “Melting Pop.” In this video, he creates a zoetrope out of a spinning cake – a “caketrope” – decorated with popcorn and chocolate. You really have to watch the video to believe it. You can also check out more of Dubosc’s animated food videos on his Vimeo page. At snack shops and convenience stores around Portugal, you will often see a perplexing yellow and red box with punch holes near the cash register. We learned that it is in fact an awesome game-of-chance involving chocolate candy, called a “Caixa de Furos,” literally a “box of holes” in Portuguese. The boxes are branded by the chocolate brand Regina, so the surprise you receive will be chocolate. So what happens is you use a little pick to punch a hole in the white circle board and then a color-coded ball falls to the bottom of the box. Depending on the color of the ball, you get a different kind of chocolate candy from behind the counter. We tried our hand at a box and got a yellow ball, which got us a Regina chocolate umbrella, one of the most iconic Portuguese treats. You can even buy a small version for your home (which might by dangerous). 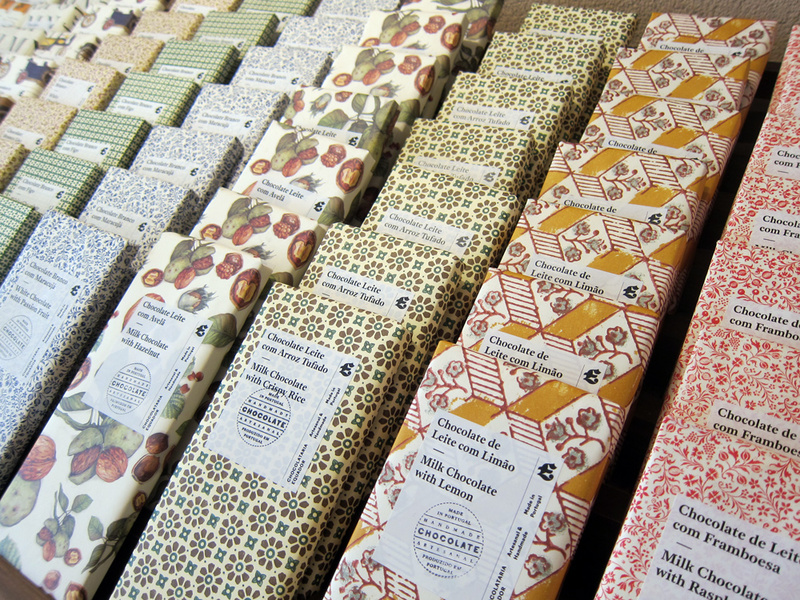 In Oaxaca we were floored by the delicious chocolate, and its almost-ubiquitous presence. There was even a chocolate street, Mina street, where you can load up on chocolate in all forms (definitely worth a future post). Many of the stores on Mina street demonstrate how chocolate is made right in the front of the shop. We were surprised to see how (relatively) easy it is to make, though the huge quantities are a little daunting. Saveur has a short instructional video showing you how it’s done, though you do need a grinder, even at home. Much has been made of the dire economic situation of Haiti, and its continued degradation especially following the devastating 2010 earthquake. During and even before French colonization, Haiti’s economy has been based on agriculture; today manufacturing is the broader basis of the economy in terms of exports, and Haiti’s main export is been clothing. However, a new possible economic driver is on the horizon: chocolate. 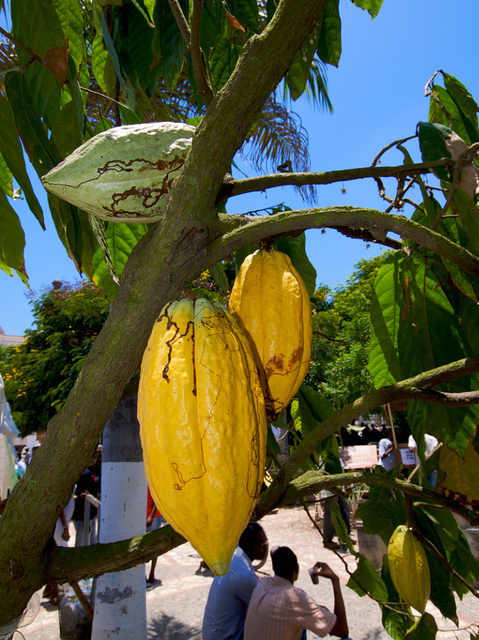 NPR recently reported on the presence of unique “mother / maman” Haitian cacao trees, which can produce more and better cacao pods than normal trees. Though these trees are not necessarily unique to Haiti, they are plentiful here, and are an untapped resource, sometimes producing twenty times the pods of normal trees. Though around 60% of Haitians work in agriculture, the cacao market in Haiti has not been a primary economic driver in recent years (though it was exploited by colonial traders in the past). Even though cacao may only be a relatively small business in Haiti, there is major opportunity. As the global taste for chocolate grows, the demand for high quality chocolate products (even at a high prices) is there. One important potential stumbling block: even though the cacao produced from Criollo varietal trees in Haiti is of high-quality, it is often not fermented post-picking, which is considered an essential step in high-quality chocolate production. Consequently, unfermented Haitian cacao beans are often sold for much less than competitors. So what are the next steps to realizing this cacao dream? Unlike many other food industries, cacao is still produced in overwhelming majority by small family farms, a model which will continue in Haiti. One collective, SOGEPA (Societe Genérale de Production Agroindustrielle, “General Society of Agro-Industrial Production”), a cacao exporter that represents 450 family cacao farms in Haiti, was given a grant by LEAD (Leveraging Effective Application of Direct Investment Project – funded by USAID) post-earthquake to establish distribution and sales channels for the farmers in the collective. US Aid has also developed a program to help train Haitian farmers in effective cacao-raising techniques. 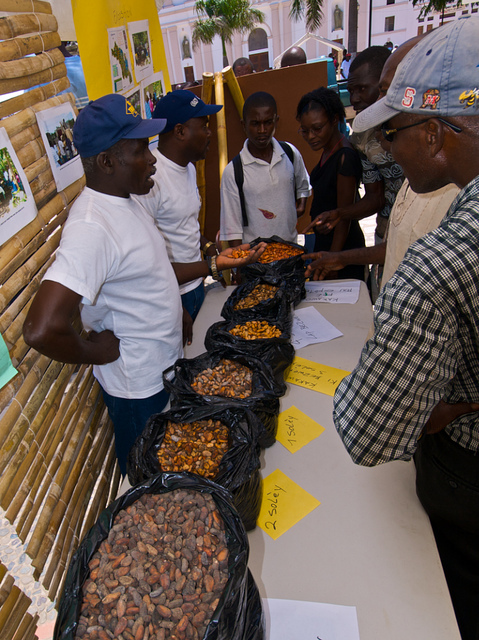 FECCANO, a collective of cacao producers in northern Haiti has also been established. Slowly, artisinal Haitian chocolate is even being made available outside of the country. On such brand, the French Fair Trade label Ethiquable, boasts a “Grand Cru” Haitian chocolate bar. Currently Haitian chocolate does not enjoy the same cache as a French or Belgian label, but that could soon change. 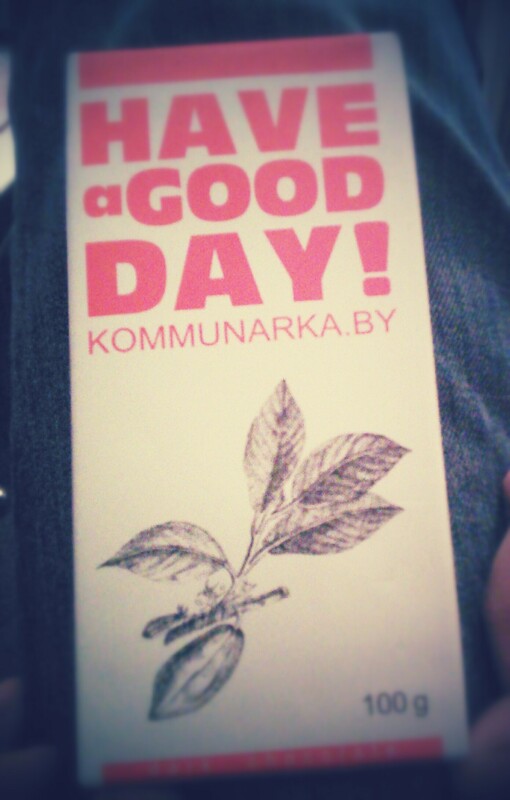 This Belorussian chocolate bar has the right idea! Happy weekend! One of our favorite things to do in a country is to sample their typical iconic breakfast foods. We have found some of our most favorite foods this way – yogurt and honey from Greece, helva from Turkey, Torta Caprese from Italy, etc. – and we find it quite a lot more enjoyable than taking a bland continental breakfast. In Spain, the breakfast treat of choice is hot chocolate and churros. In the US, churros have something of a dubious reputation. While, of course, you can find some excellent renditions of churros in the US, the sugar-coated, soggy churro is often the purview of school lunches and amusement parks. I had personally sworn off churros after they were the only dessert offered in our junior high cafeteria. However, I am open to an opinion change. Churros are a different affair in Spain though: no extra sugar is added, and the fried pastry is the whole deal. However the best part of having churros is dipping them in the thick, rich hot chocolate that traditionally accompanies them. No Swiss Miss hot chocolate here: this is thick, rich sipping chocolate. They sometimes even give you a little spoon to eat it with. We tried chocolate and churros and two locations in Madrid, each of which was completely different. The first stop for churros was Chocolatería San Ginés (Pasadizo de San Ginés, 5, Madrid). All they serve is chocolate and churros, and boy do they serve a lot! We went on a Saturday night, which admittedly is probably the most crowded time you can get chocolate and churros, and there was a line snaking out of the door. The routine is similar to Giolitti: you order and pay and then get a receipt for what you ordered. If you are able to get one of the tables (either inside, outside or in the basement) the waiter will take your ticket and give you your order. The only things available to order are chocolate, churros and porras (a thicker churro). The churros were excellent: a nice portion and not at all greasy. The cost of a cup of chocolate and 6 churros is less than 4 euros. On our last day we sampled churros from Chocolatería Valor (Calle Postigo de San Martin, 7, Madrid), which is more of a regular full service café. We visited Valor at an admittedly off hour, 8:45 on a Monday morning. So we were very pleased to find that a fresh batch of churros was fried up just for us. Perhaps as a product of their freshness, we found these churros a little greasier than the offerings from San Gines. However, the price was a lot cheaper, and you could get additional items off of the menu if you so desired. There are even paper cones for those who want to take the churros to go. Going to Madrid completely changed my idea of the churro (especially when combined with hot chocolate). We especially enjoyed Chocolatería San Ginés, and we are looking forward to going back someday and trying more varieties. Do you have a favorite place for churros in Madrid? As much as cupcakes and the myriad permutations thereof are popular in the USA, brigadeiros are the primary bite-sized dessert in Brazil. Named for a Portuguese brigadier in the 1940s, a brigadeiro is essentially a chocolate caramel truffle coated in chocolate sprinkles. However, much like cupcakes, riffs off of the traditional brigadeiro are increasingly common, including exotic flavors and coatings. If you are not looking for anything fancy, the basic brigadeiro is found at most Brazilian restaurants and cafes, and pretty much every snack shop has brigadeiros in stock for less than a dollar. Perhaps the best thing about the brigadeiro is how easy it is to make, and how few ingredients it requires. For example, this America’s Test Kitchen recipe has only condensed milk, butter and cocoa. Some other recipes, like these from Honest Cooking and Cuca Brazuca also require chocolate drink powdered mix. The typical finish for a brigadeiro is being rolled in classic chocolate sprinkles, though another Brazilian favorite is a coatings of large black and white candy puffed-rice spheres known as “crocantes.” Of course you can also play with different brigadeiro flavors, including peanut butter or almond! If you are in Brazil, we highly recommend some exploration to find your favorite brigadeiro. Nearly every corner bakery/cafe/deli/lanchonete will have brigadeiros for sale, so you can sample dozens a day, if you would like. If you are going for something unique, visit Maria Brigadeiro ( Pinheiros: Rua Capote Valente 68) in São Paulo, where there are over 20 varieties of gourmet brigadeiros available at the shop, including esoteric choices like Port Wine or Sesame. Time Out São Paulo has a feature on the some of the other best brigadeiros in Sao Paulo. Our favorite Brigadeiro stop in Salvador was Brigadeira Mix in Shopping Barra, which was just a small kiosk, but it boasted a large variety of flavors, including our favorite, negresco (cookies and cream). But brigadeiros are not only the purview of fancy shops. In Rio de Janeiro you can buy them on the street (though it is a wonder that they don not melt in the heat). Our favorite classic brigadeiros in Rio de Janeiro are found at Bomboniere Pathe (Centro: Praça Floriano nº- 45). But don’t take our word for it – go try some for yourself! While wandering throughout historic Ouro Preto you will see stores selling Doces Caseiros, but you will also find them selling the one thing we like even better: chocolates. We visited a couple of chocolate shops while we were in Ouro Preto, and were surprised by the quality of the chocolates and the extensive menus. If you have a sweet tooth, you will never go hungry in Ouro Preto. Puro Cacau (Rua Conde de Bobadela, 162) stands out on the street due to the large chocolate fountain in the window. That was surely enough to draw us in. A trip to the chocolate fountain (with a skewer of strawberries) cost a mere R$ 5. We were also pleased to find they had milkshakes, which were excellent (we went with cookies and cream). The menu also had a selection of paninis and wraps, which were good, but nothing to write home about. However, as the name would imply, the main reason to visit Puro Cacau is for the chocolate-related offerings. The entire front of the store is given over to selling jars of doce de leite, homemade bon bons and alfajors (Argentine sandwich cookies filled with dulce de leche). You can also buy simple candies and truffles by weight out of glass jars. There was something deliciously retro about filling a paper bag with little chocolate candies. Even beyond chocolates there was an unusually extensive selection of bottled drinks and beers from around the world. Chocolates Ouro Preto became our go-to lunch and coffee spot when we were in Ouro Preto, not to mention the fact that we had many a sweet treat there. For those of you that are always plugged in (guilty here) there is also free Wifi. Chocolates Ouro Preto – right on Praca Tiradentes! In the front of the store you can buy their chocolate items, including a huge amount of chocolate bars and very delicious truffles (R$ 2.50). We particularly enjoyed the passionfruit filled dark chocolate variety. We also appreciated the amazing selection of coffee drinks and other juices for those who are trying to be caffeine-free. There was also a large assortment of ice cream flavors. For those with a bigger appetite, there were other savory treats, including full entrees soups and breads. We had one particularly delicious soup: creamy mandioquinha. Kind of like cheesy cream of potato soup, but better! There were also various salgados, pão de queijo and pão patate. In the USA, Easter is associated in pop culture with rabbits and bunnies. However, in Australia, you are also likely to see a bilby alongside the bunnies. Bilbies are native, endagered Australian marsupials that have floppy ears and a long snout. Rabbits are considered an invasive species in Australia, so it makes sense that they might prefer Bilbies at Easter time. The campaign for the Easter Bilbies was popularized by the Foundation for Rabbit-Free Australia, and the concept has taken off since, with children’s books and chocolate Bilbies galore.